Roasting carrots intensifies their natural flavour. Adding this honey-mustard glaze put them "over the top!" 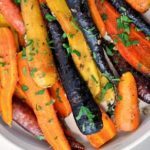 These Roasted Carrots with Honey-Mustard Glaze make an ideal holiday side dish. Scrub the carrots. Cut larger ones in half lengthwise so that carrots are of uniform sizes and place them in a large bowl. In a separate container, whisk olive oil, minced garlic, rosemary, mustard, honey, salt and pepper. Combine thoroughly and pour over carrots, coating evenly, making sure they are all well-coated. Arrange in a single layer in a parchment paper-lined baking sheet. Avoid having them touch each other. Use two baking sheets if necessary. Roast in the oven for 20-25 minutes, turning occasionally until tender and just beginning to brown. 1. Use a baking sheet with no edges. I use a cookie sheet. You want the natural sugars in the vegetables to caramelize so they develop those nice browned, crispy surfaces. If the pan has sides, the heat tends to be trapped inside and the vegetables cook by steaming instead of roasting. 2. For the same reason, make sure the vegetables aren't touching each other.